X-ray and UV radiation from the flare sent waves of ionization coursing through Earth's upper atmosphere. This briefly disturbed the propagation of shortwave radio transmissions around the dayside of our planet, especially over Europe and North America. Conditions have since returned to normal. The flare came as little surprise. A phalanx of large sunspots is crossing the solar disk, and forecasters have been predicting an explosion for more than a week. However, the source of the flare was unexpected. It came from a minor and seemingly harmless sunspot named AR2113. Appearances notwithstanding, AR2113 has a 'beta-gamma' magnetic field that harbors energy for M-class solar flares. With this flare, AR2113 joins two other sunspots capable of potent activity: AR2108 and AR2109. 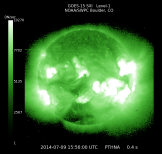 NOAA forecasters estimate a 75% chance of M-flares and a 20% chance of X-flares on July 9th. 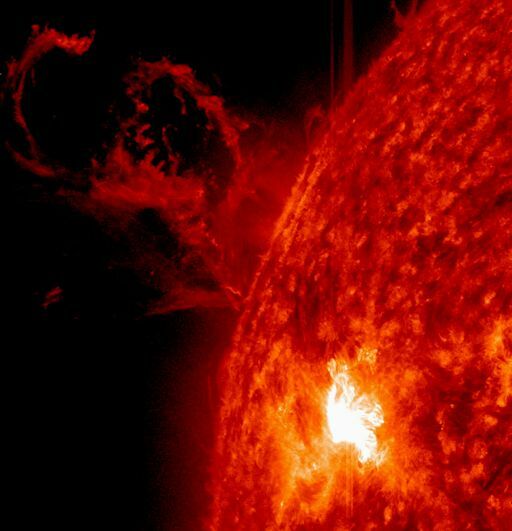 Solar flare alerts: text, voice"